The SGTC Supah Valve! Dump compressed air faster than ever before! This is the mother of all pneumatic launcher valves!!! This valve operates on several premises for spudgun use: It carries the simplicity of 'plug and play' like a hardware store solenoid controlled valve, just no batteries or buttons to mess with. Has the instant reactivity of a diaphragm valve, as it opens anywhere from 5 to 50 times faster than a conventional valve. Finally, opens up all the way, as in a piston valve, for no flow bottleneck or restriction for minimum pressure drop and maximum spud velocity! 2 inch female NPT inlet and outlet ports. Opens with the ease of flicking a tiny valve, no wires, batteries, or switches to deal with. 'Real-like' air-trigger option also available. Parts are all pressure grade PVC pipe fittings with SOLID PVC static and dynamic bulkheads. Various inlet and outlet option fitting selections available (some pictured below). Design operating pressure MAX 120 psi!!! For use with compressed air (inert gases like CO2, Nitrogen ok too) only. "This thing is phenominal!!! Simple, efficient, LOUD, and downright easy to use. I shot a Vortex 2" diameter football thingy well over 300 yards at ~25 PSI"
"The more i play with it the more i like it, it seems to work with my 3" barrel just fine, it will dump my 6 gallon air tank pressurized with 100 psi in a fraction of a second and like you noted, it's LOUD. yesterday I took the launcher minus the barrel into work to show everybody, and I was surprised at how loud it really is. Most of my other cannons used sprinkler valves and I had to carry around batteries and wires; it looked like a rat's nest." "The valve is terrific and passes air just like you say, Super Quick and with quite a loud "report"....Just as advertised, the supreme pnumatic spud chucker air valve. Great job. I really don't understand how this thing works and maybe in a few weeks I'll take her apart to understand. For now I just plan on blowing away my friend with some more demo launches. What a beast!" The latest improvement to the most radical pneumatic launching valve available. 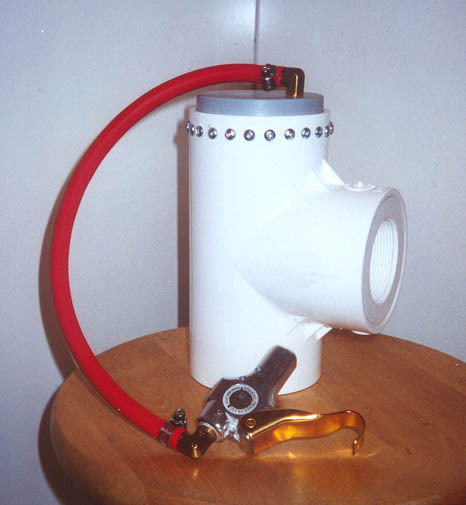 Using a 3/4" sprinkler valve as a pilot valve and featuring an oversized piston exhaust port, The Supah-Valve+plus actuates 400% faster than the original Supah-Valve. An other advancement is that it is also available with electric actuation. (for those of you that like batteries and wires) Shown below is the version set up for pneumatic trigger type actuation.